DIY Powerbank with 18650 cells - anyone tried these ? Okay - so the problem here is the cells. Ultrafire 4000mAh = 1100mAh. They are being returned and replaced with Samsung cells. There are a lot of fake 18650s out there. 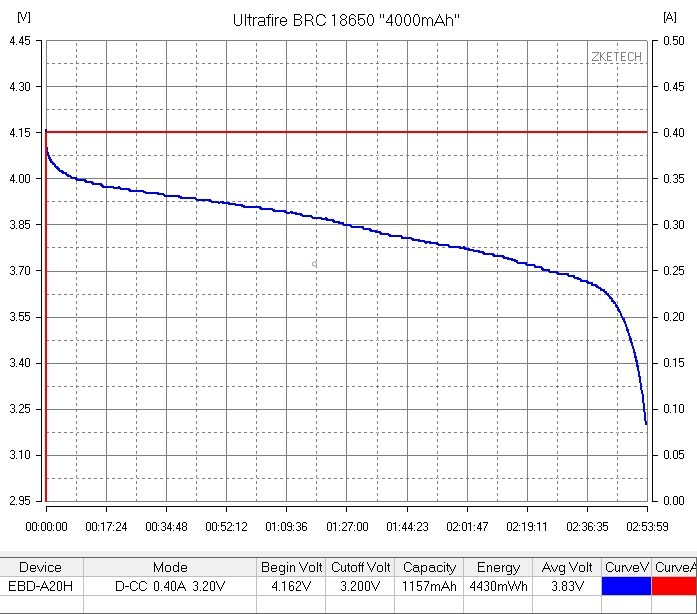 I think the highest capacity 18650 is about 3600mAh, but generally over 3000mAh you get all kinds of trade-offs: less cycles, too sensitive, higher internal resistance, slightly large physical size etc. Probably the best bet is something around 3000mAh from a reputable manufacturer. Also, there is no genuine Ultrafire over 3400mAh and even that is really expensive. Agreed. Clearly what I bought is not as described. 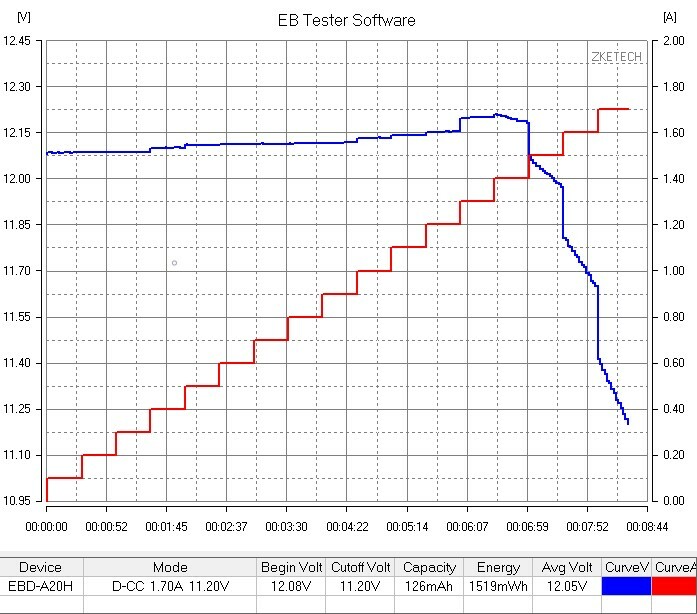 Incidentally, if any UK activators want their batteries characterised on our system, PM me. Okay up to 1.4 Amps - not enough to power an FT-817. Ouch … so it looks like it’s not of much use after all. Thank you for testing this for everyone. Probably okay for some radios - but not the 817. BTW just did a test on a Samsung 2600mAh 18650. The measured capacity was 2660mAh. One further thing that I have discovered about this unit is that it has no charge balance circuitry. Thus, if you put in one discharged cell, as I did after my cell capacity test, the Powerpack then fails to charge properly. All in all a bit rubbish. There is also a 8300mAh version with 12V/6A output for £54. There are millions of BM’s available online and they arent that expensive. Even if there was, the unit would have to be extensively modified as it seems to run two sets of two 18650s in parallel. It does not deliver sufficient current anyway. 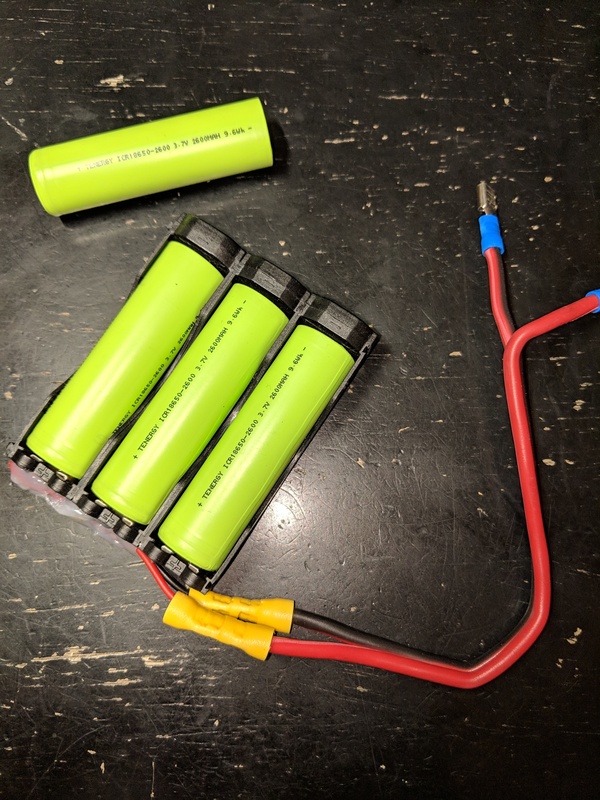 I had a USB powerbank with 3x 2.5AHr 18650 cells in it. The cells were in parallel and there was the standard dual USB A socket outputs and a USB microB input along with 2x 5V outputs at 1A and 2A. I ripped it apart, removed the charger+inverter and wired the cells in series and brought out the individual cells so I could balance charge it. Now I have a 2.5AHr pack that can drive an 817 to full output that looks identical to a normal USB powerpack. The kind of thing airport security people see in the millions every year and don’t care about. I just need to remember not to plug my phone into it ! That goes a bit easier on the cells than a soldering iron; does a nice looking job too. I keep meaning to knocking one up for myself. 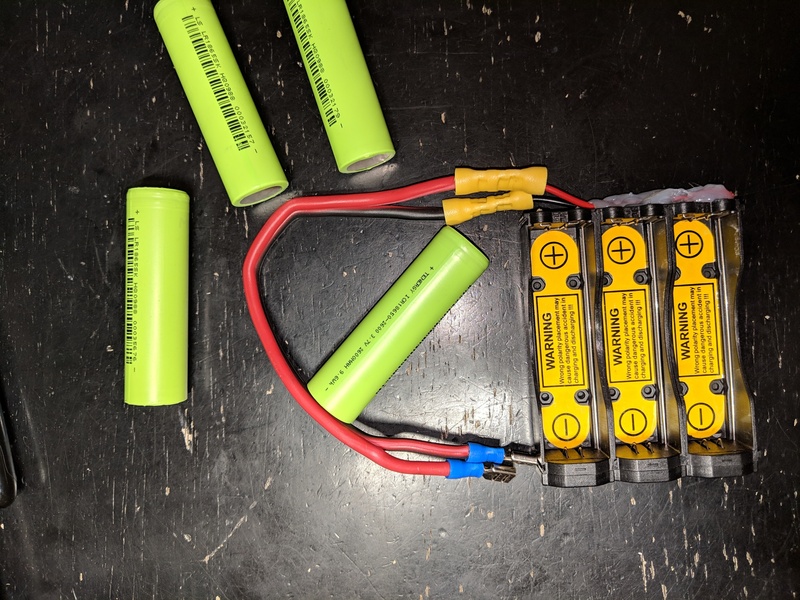 I’ve taken apart a few old laptop batteries now, and the cells were all in perfect working order. It’s possible that the circuitry is failing, rather than the cells. All items chosen to keep your pack light. Update, 3S1P arrived (3 cell in series) activated PCB at full charge output at 12.52 v. No soldering, easy cell exchange, KX2 compatible, convenient external power pack when Anderson powerpoles attached. Could not be happier. 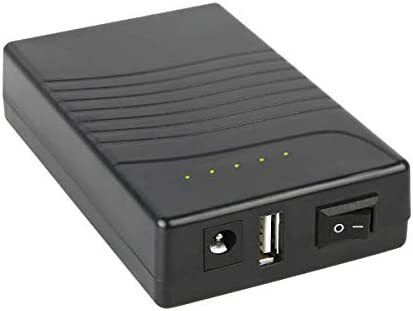 I have been using this 6 amp hour version of the “TalentCell Rechargeable 12V 6000mAh/5V 12000mAh DC Output Lithium Ion Battery Pack For LED Strip And CCTV Camera, Portable Li-ion Battery Bank With Charger, Black (Multi-led indicator)”. I use it to power my FT-817 and charge the cellphone. I have also used one to power my Tinker board running WSJT-X. I have not noticed any serious RFI from the 12 volt to 5 volt converter. I am coming late on this, sorry but here is another example of bad bttery banks, which are popular on eBay. 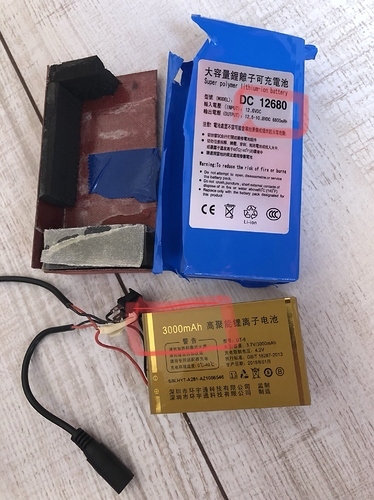 6800mAh printed on the label but below the blue coat you’ll find a Chinese 3000mAh battery and some foam to make you thinking it is a real 6800mAH battery. I always stick to NCR, Samsung, Sony etc for 18650. That is blatant misrepresentation, though I do think there is a misconception among some retailers who think that if one cell is 3000 maH, then 3 cells make it 9000. That is, they think the maH ratings add like the voltage does. Doesn’t excuse it, but it may be the reason in some cases. Not this one, which shows a smaller battery being repackaged to look like a larger one. Thanks for posting the pic.